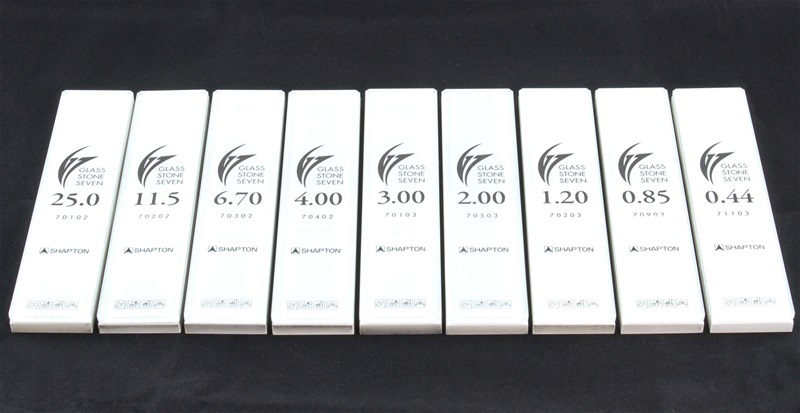 Shapton has expanded the range of stones available for their GlassStone Seven Knife Sharpening Kit. In addition to the three stones included in the kit, there are now an additional 6 grits to choose from, increasing the flexibility of this already impressive sharpening system. The "Seven" in the name of the Shapton Glass Stone Seven, refers to the 7mm thick layer of abrasive on each stone. This 7mm of abrasive is 2mm thicker than the 5mm layer found on the Shapton HR and HC Series Glass Stones. Like Shapton's other Glass Stones, the stones in the G7 Kit are mounted to a 5mm thick glass base, making for stable, long lasting sharpening stones. As you would expect from Shapton, the G7 Stones are splash-and-go. Simply get them wet and they are ready to use. No need to soak them before sharpening, so you can get back to using your sharp knives faster. The grits of the G7 stones are unique, they are not simply smaller copies of the other Shapton Glass Stones. The selection of grits in the kit provides a comprehensive range for complete sharpening of knives. 11.5 micron - about 1,500 grit. The G7 Stones are 160mm x 37mm, or about 6-1/4" x 1-7/16". This is a bit smaller than the 210mm x 70mm, or 8 1/4" x 2 3/4", size of the HR and HC series stones. They are designed to fit the stone holder of the GlassStone Seven Knife Sharpening Kit, but they can also be used independently. 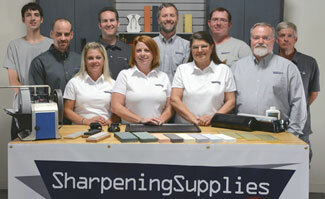 Sharpening Supplies is an authorized Shapton retailer. Shapton products are made in Japan. Q. Are the stones made of glass? A. The stones themselves are not made of glass. The Shapton GlassStones are backed with 5mm of glass to provide a firm, flat surface for which to adhere the ceramic water stone abrasive material.